Atlanta, GA (June 10, 2012) – Each year Blade Magazine acknowledges the best of the industry at their annual awards banquet held during the Blade Show and International Cutlery Fair in Atlanta. The American Knife & Tool Institute was honored during this year’s banquet with the Blade Magazine 2012 Industry Achievement Award. Most recently, in May, the Louisiana governor signed AKTI legislation that made it very clear that a knife with a bias toward closure is not an illegal switchblade. Bias toward closure language is a concept that has stood the test of time since AKTI introduced it in California over a decade ago. Several states, including Texas and Kansas, have since adopted it, as well as it being incorporated into the Federal Switchblade Act. This language clarifies that assisted opening knives are not classified as illegal switchblades or gravity knives. See more information about the bias toward closure concept and AKTI’s past successes honored by Blade Magazine. 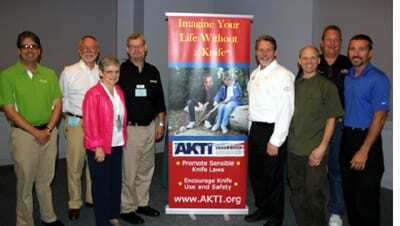 Currently AKTI is working with legislators in South Carolina to pass preemption language, Pennsylvania to remove all knife restrictions, Michigan to remove the switchblade prohibition and other restrictions, Alaska to incorporate the bias toward closure language, as well as in several other states to remove or lessen knife restrictions. Also receiving an Industry Achievement Award at the banquet was Knife Rights, founded in 2006, for their legislative efforts.